Robots and 3D printing. Virtual reality and lasers. Solar power systems and jet engines. 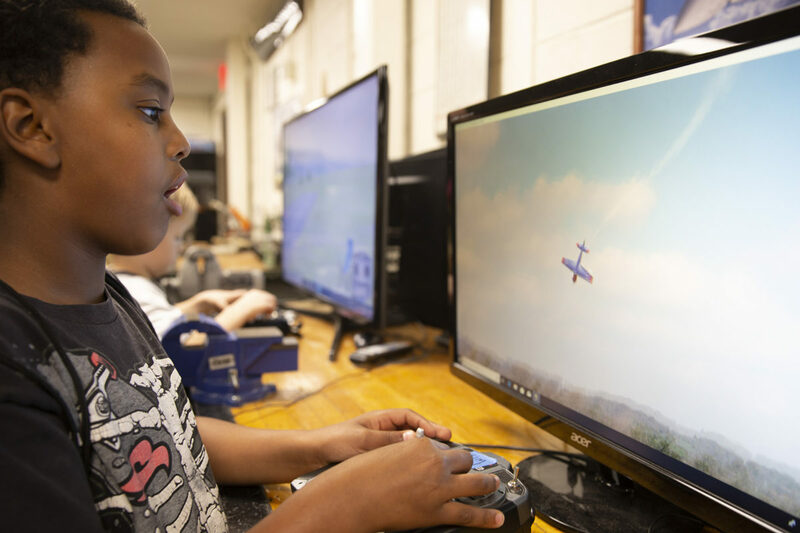 Rocketry and flight simulation. 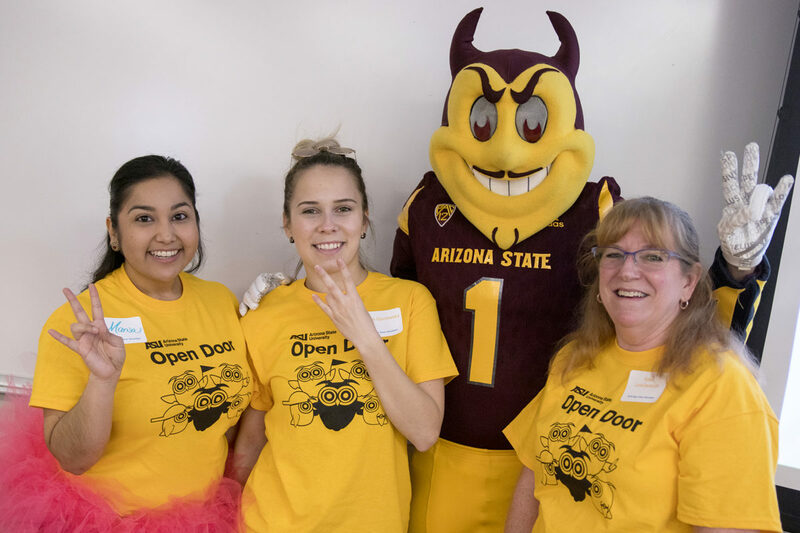 Those were only a few of the attractions that provided more than enough opportunities to fill an afternoon with interactive fun and learning at Arizona State University’s Open Door at the Polytechnic campus on February 2. 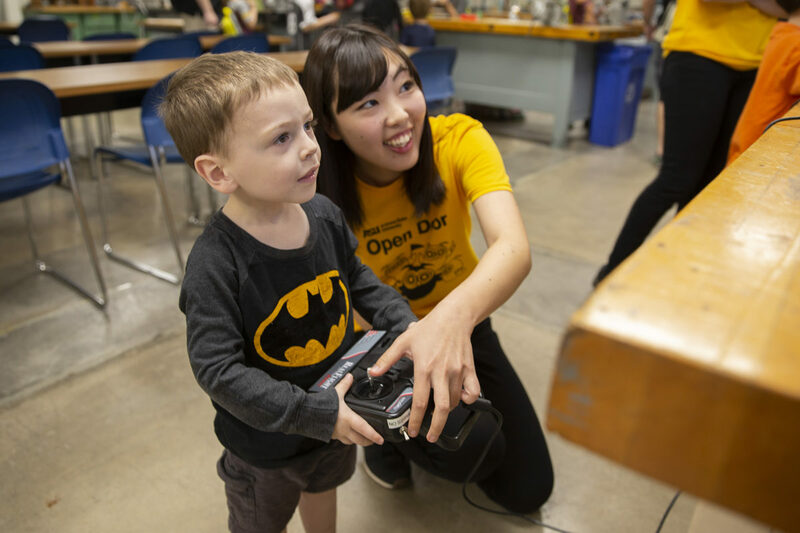 Hundreds of parents with their young children, along with elementary and middle schoolers and people of all ages toured research labs, watched demonstrations of new and innovative technologies and joined in games and other hands-on activities. The Ira A. Fulton Schools of Engineering partners in the event, which welcomes Open Door visitors to experience the broad and enthralling spectrum of pursuits in the technical, social and natural sciences, as well as engineering, and the cultural and artistic endeavors that make up ASU’s vibrant educational environment. Ike F. (left) takes charge of the controls of a remote flight simulator in The Polytechnic School’s Aircraft Structures Lab. Photographer: Erika Gronek/ASU. 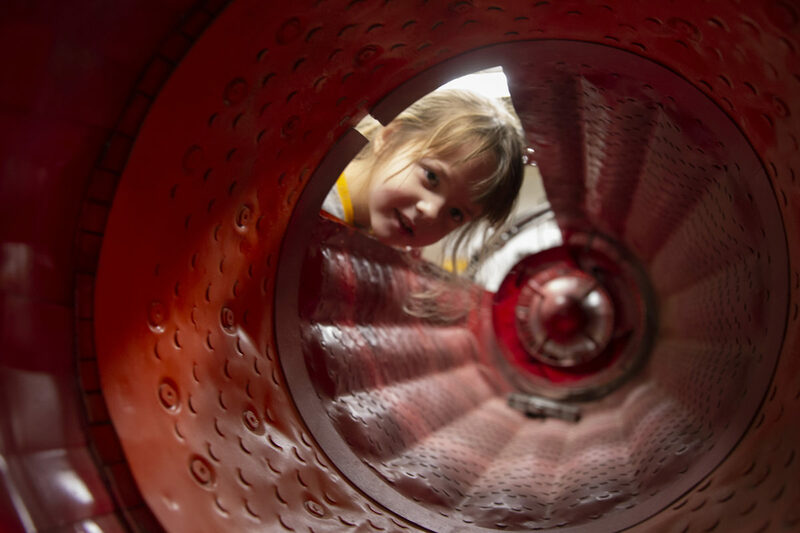 Mara Jade W., checks out the inside of a jet engine at Open Door @ Polytechnic. 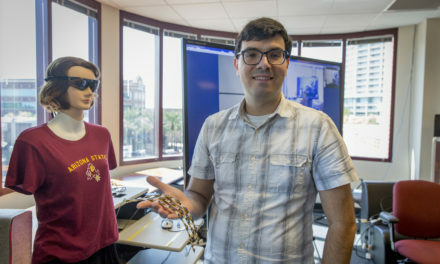 She was one of many guests who got a behind the scenes look at ASU's aeronautical management technology program that trains future pilots and air traffic controllers. Photographer: Erika Gronek/ASU. Thad B. remotely controls a plane in The Polytechnic School’s Aircraft Structures Lab. 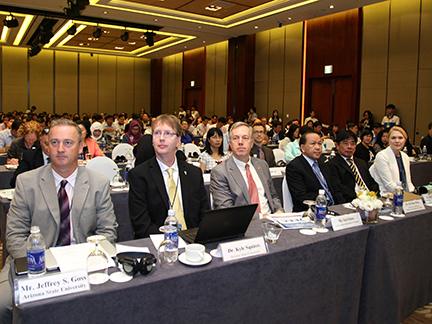 In this activity, participants learned how aerodynamics can affect unmanned aircraft. Photographer: Erika Gronek/ASU. 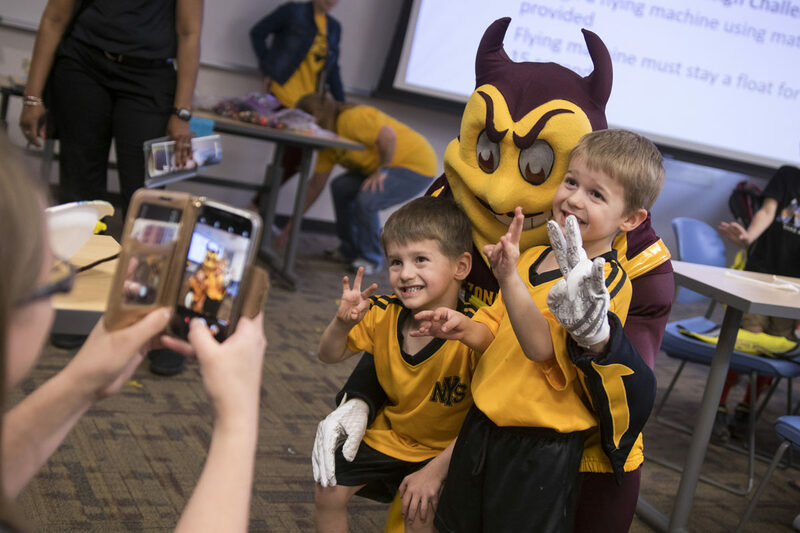 Twin future SunDevils GQ and Devin take a break from the Engineering Design Challenge to practice their pitchforks with Sparky. Photographer: Marco-Alexis Chaira/ASU. 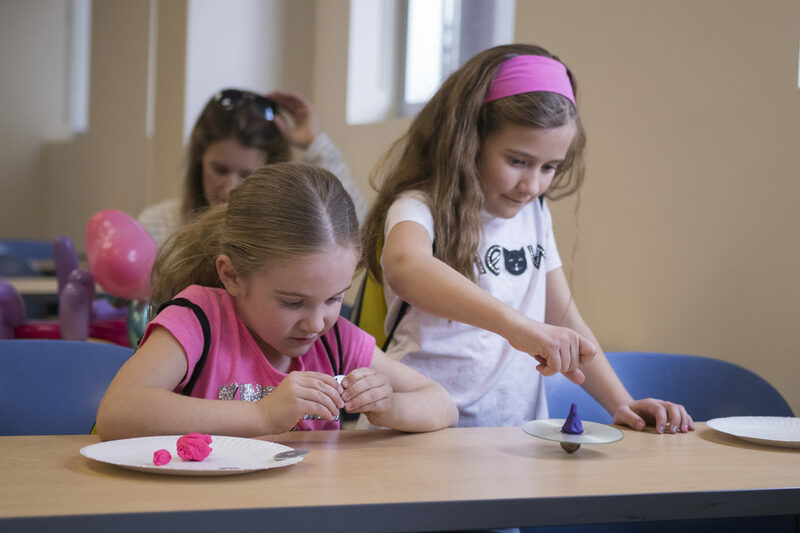 Alia and Jada think creatively to make spinning tops using unconventional materials at ASU’s annual Open Door @ Polytechnic. Photographer: Marco-Alexis Chaira/ASU. 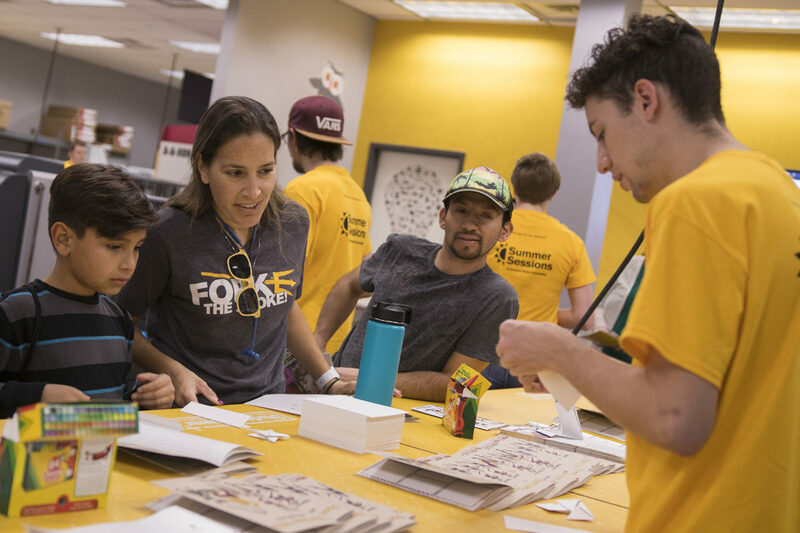 Javier, Rebecca and Xander take in the different folding techniques used in the ASU Print and Imaging Lab and learn how to make their own hero gear at BOOM! POW! PRINT! an exhibit hosted by ASU’s Print and Imaging Lab. Photographer: Marco-Alexis Chaira/ASU. 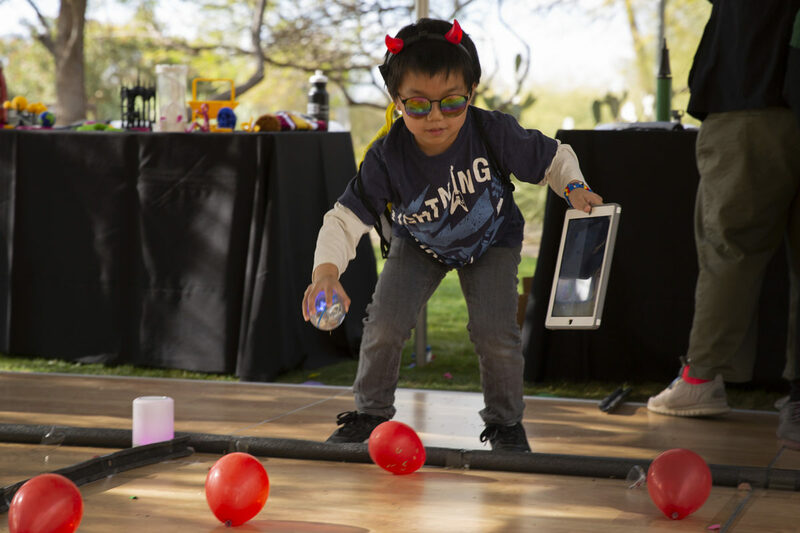 This future Sun Devil begins to guide a sphero robot through a maze of treacherous balloon obstacles during ASU’s annual Open Door @ Polytechnic. Photographer: Erika Gronek/ASU. 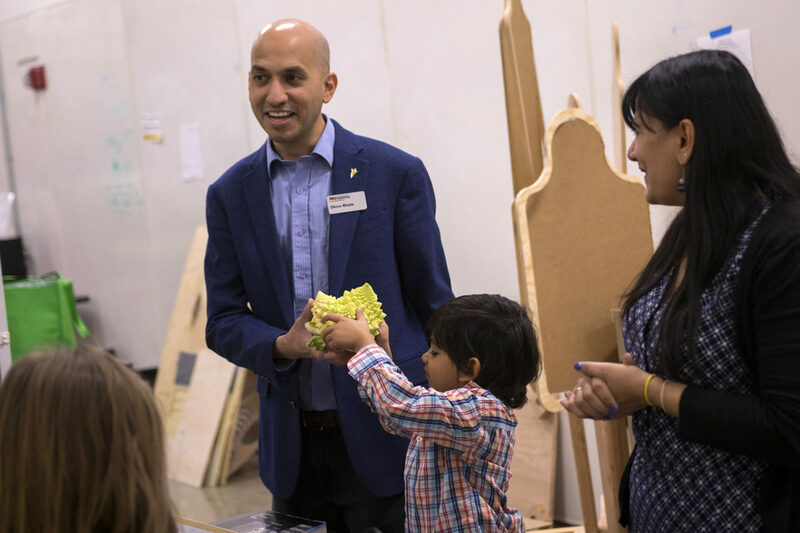 Associate Professor Dhruv Bhate explains how nature influences the structure of 3D-printed materials with a little help from his favorite assistant, his son Reyansh. Photographer: Marco-Alexis Chaira/ASU. 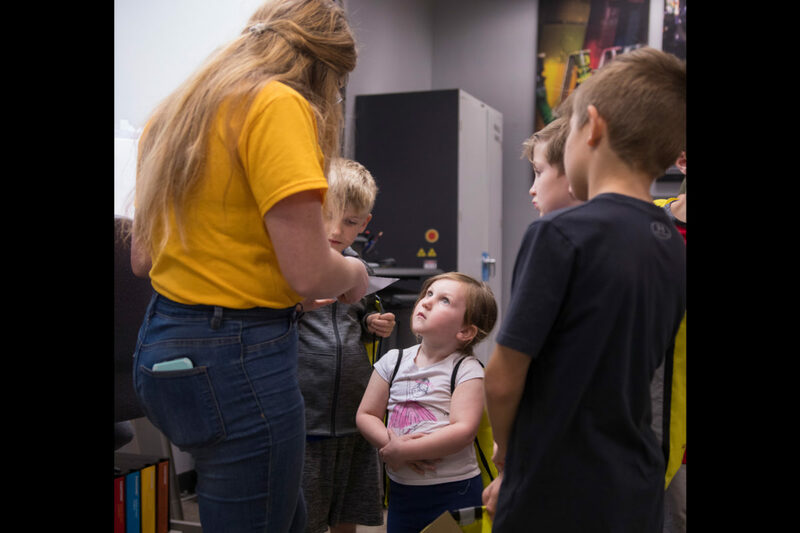 Ava is mystified by superheroes and the countless printing possibilities on display in ASU’s Print and Imaging Lab exhibit BOOM! POW! PRINT! Photographer: Marco-Alexis Chaira/ASU. Warren J. helps guide a plane in for a safe landing at the Air Traffic Control and Radar Simulator. 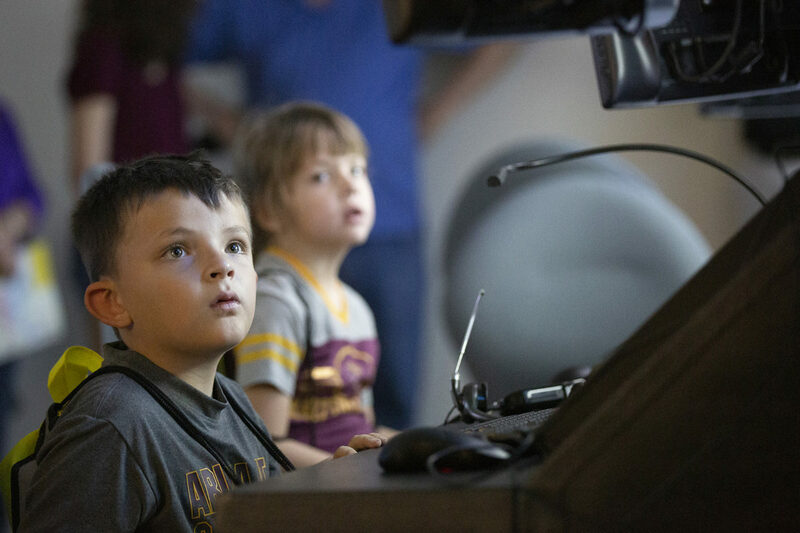 This is one of two ATC labs at ASU’s Polytechnic campus and simulates real-life scenarios that take place at the Phoenix Sky Harbor International Airport. Photographer: Erika Gronek/ASU. 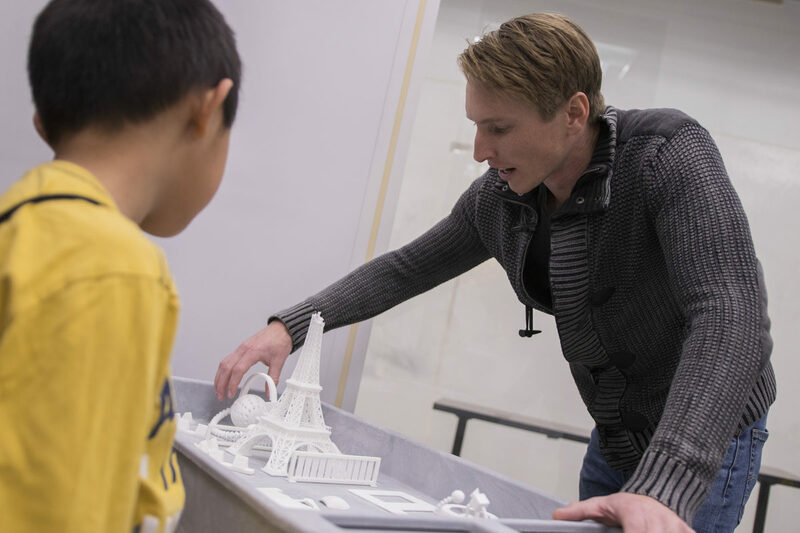 Paul Paradise, a doctoral student in the Fulton Schools’ materials science and engineering program, shows off some neat nylon prints in the Innovation Hub Maker’s Lab. Photographer: Marco-Alexis Chaira/ASU. 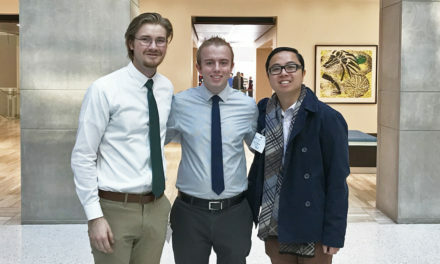 Inspiration strikes Lucas W. (left) at this year’s ASU Open Door! Photographer: Erika Gronke/ASU. 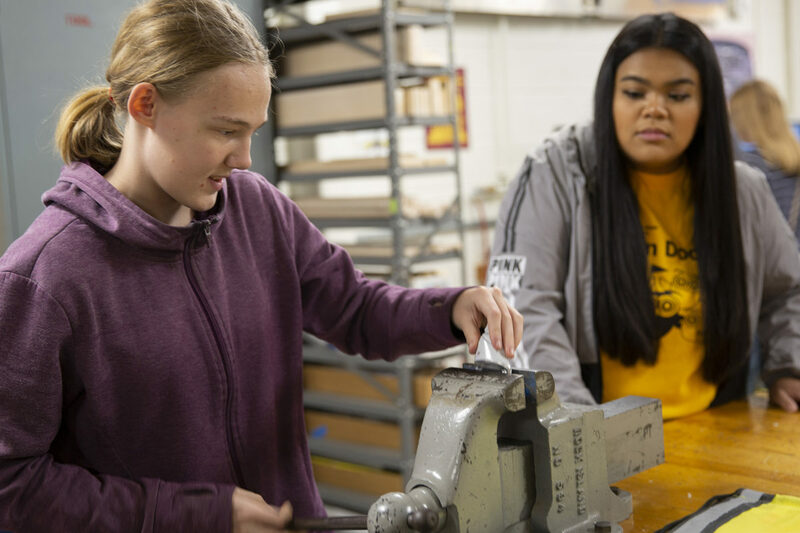 Cassie D. (left) crushes cans in a vise to learn about pressure on aircraft at the Open Door Aircraft Structures Lab. This was Cassie’s fifth Open Door event. When she gets older, she is interested in studying robotics engineering at ASU. Photographer: Erika Gronek/ASU. 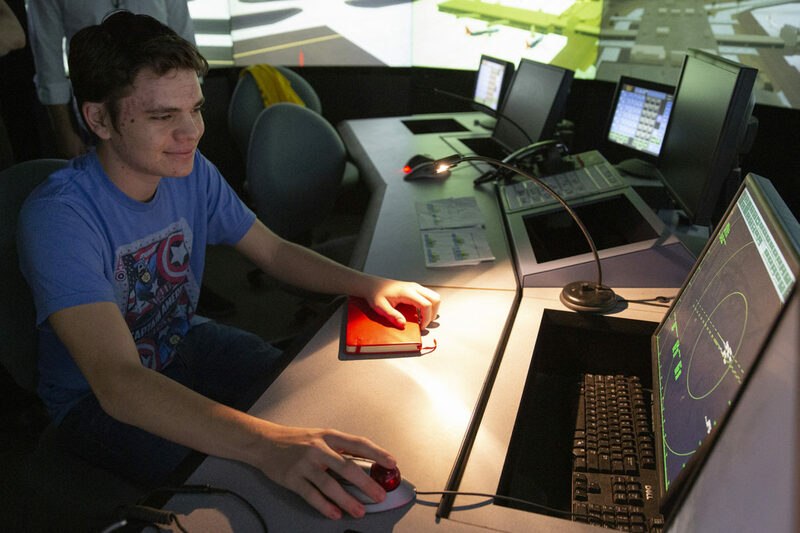 Adrian G. brings the plane simulator up to cruising altitude at ASU Open Door @ Polytechnic. 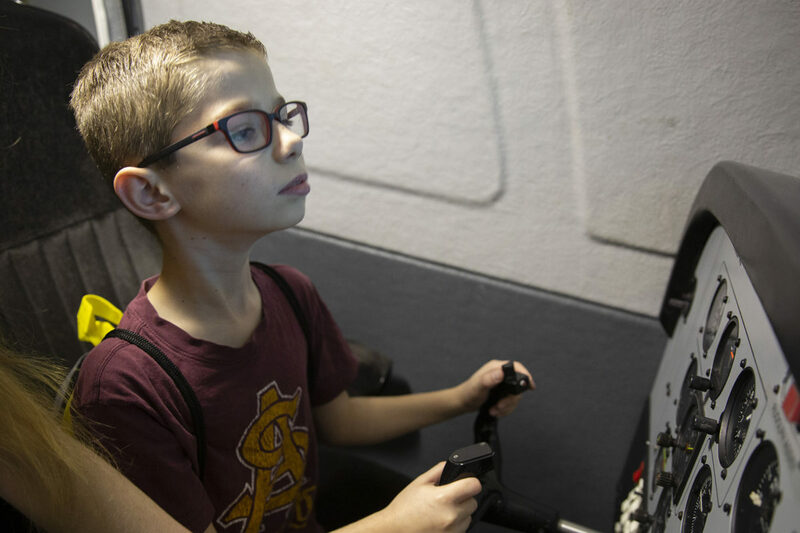 He was one of the many young captains helping to pilot ASU’s fleet of five flight simulators. Photographer: Erika Gronek/ASU. Thank you to all our volunteers that make events like these possible! Photographer: Marco-Alexis Chaira/ASU. 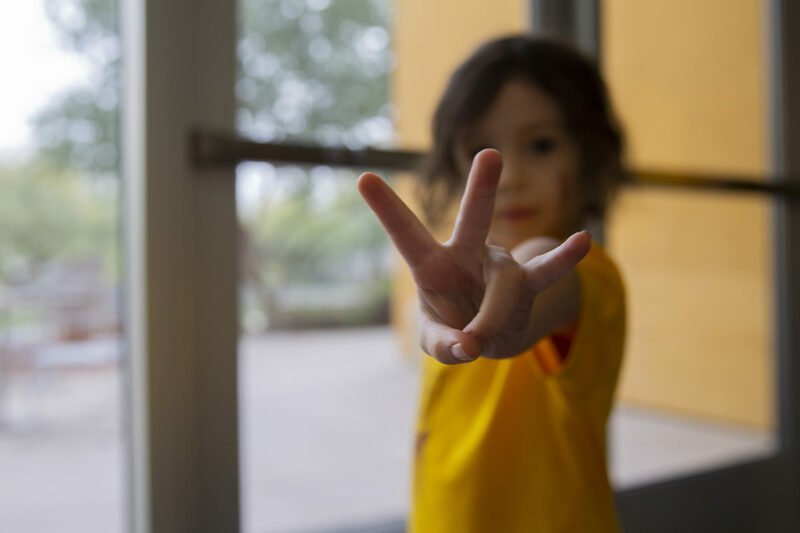 Tabitha R. shows off her best pitchfork while taking a tour of Century Hall, the home of first-year engineering students on ASU’s Polytechnic campus. Go Devils! Missed us at Polytechnic? 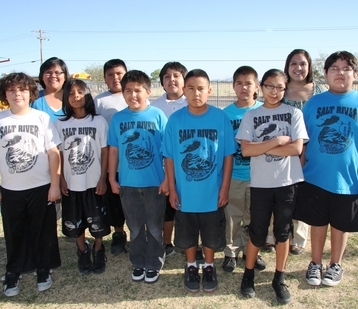 Check out the Fulton Schools at Tempe Open Door on Feb. 23! Photographer: Erika Gronek/ASU.